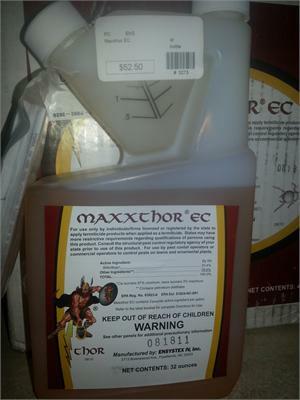 MaxxThor EC, in the form of a dilute insecticidal solution, prevents and controls subterranean termite infestations in and around structures and other items by creating a continuous chemically treated zone (horizontal and/or vertical as needed) between the wood and other cellulose material in the structure and termite colonies in the soil. In order to establish a barrier between the wood in the structure and the termites in the soil, adequately disperse the solution of this product in the soil. Would you like to see the MaxxThor EC Label & MSDS?